#4. 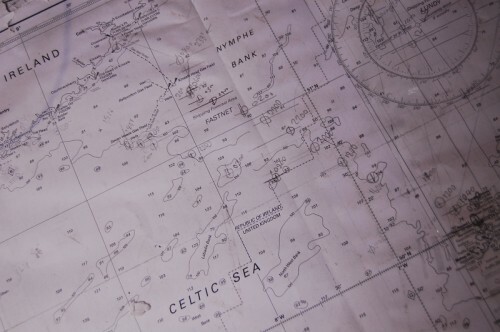 Cork to Falmouth – Sampson Boat Co. The delivery took time, and when I returned to Ireland, summer was away and winter was peeping over the horizon. Depressions were marching across the Atlantic in tight formation, and in the streets of Cork, people had their jackets buttoned up. I hitch-hiked out to Baltimore, and was relieved to find my boat bobbing happily where I had left her, although she looked a little lonely in the now-deserted anchorage. Somebody must have used my dinghy, because it had been left upside-up, and was full of rainwater, but they kindly neglected to steal my oars, so I rowed home and set about getting rid of that neglected boat smell. My old friend Graham Bailey, who pretty much started me off sailing, was anchored just outside Church Strand in Peel Castle, his beautifully restored Cornish Lugger. I sailed out and dropped the hook close by, and we were off to the pub to catch up. The tail end of a depression had left use with some moderately useful NE’erlies, and there was a couple of days until the next one was due to come howling in, so I decided to bite the bullet and get on with it – it looked like the last window for a while, and my inquiries about winter work in the area hadn’t yielded anything terribly exciting. 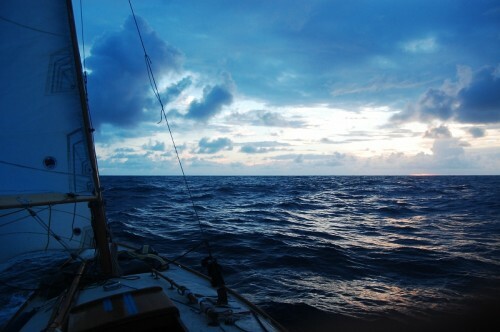 So I sailed out at first light, with a slightly sore head and a bag of grub from the generous Graham. 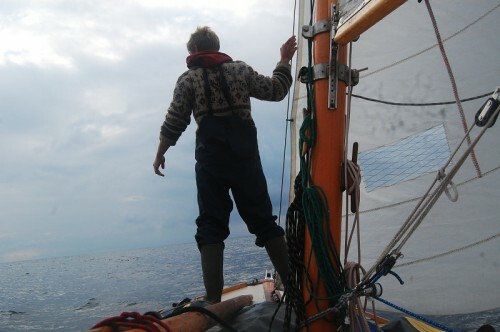 The window wasn’t long enough to cross Biscay, which had been my plan earlier in the year, so I made a beeline for lands end, thinking that I could take a left for Bristol or a right for Falmouth, two places where I have contacts and work. The first day was unpleasant. It rained, it howled, and it threw me around. 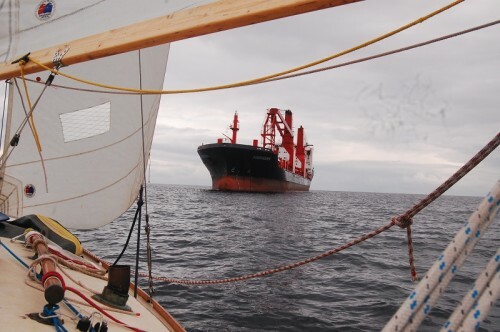 I had become used to sailing a bigger boat, and the motion of a small one in short sharp swell perturbed me, It was never more than mildly terrifying, but I found I couldn’t eat a thing for the first 20 hours. After that, things were just starting to look up, when I was becalmed in the middle of the night. I bobbed around listening to the banging of the slack sheets, warily encouraging the next depression. A few hours on, and the wind came with the sun. A nice SW’erly to blow me home, and it stayed with me all day while I scanned the empty horizon, dozed, checked gear, and caught up on my eating schedule. Night arrived, and still Lorema thundered towards home. She had caught the scent now, and could not be deterred. We had a small scuffle at the last minute about whether we should return to my home, Bristol, or her (adopted) home, south Cornwall. In the end, she won, as a good woman is likely to, and we altered course slightly to starboard. That night, I had a real treat. As I looked over the stern, I saw phosphorescence like I had never seen it before. The keel of my boat left a highway of neon green stretching away into the distance. A splash of an oar into the passing black blossomed into a meteorite of sparks. I sat and admired it for a while, and then started as I saw several green torpedoes heading for my little wooden boat, fast. The dolphins had been coming and going all day, but now they were illuminated by this strange heavenly light. Phosphorescent dolphins I had witnessed once before, but not like this.. Their outlines were so clearly defined that you could see their details better than in daylight. They played in the bow wave and I goggled. Later that night I passed Seven Stones, and crossed the Lands End TSS, dodging a few blocks of flats on the way. 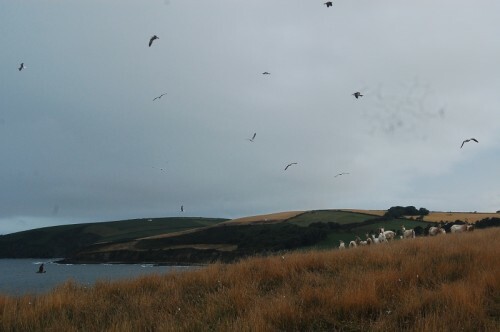 The sun rose over mounts bay, and the wind stayed favourable. 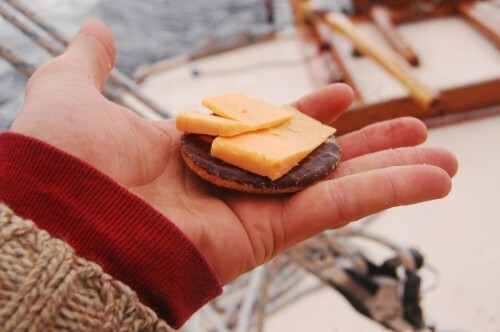 I breakfasted on chocolate digestives with cheese. The dolphins were back but all my attention was on the coastline, admiring the familiar nooks and crannies of the distinctive Cornish landscape. 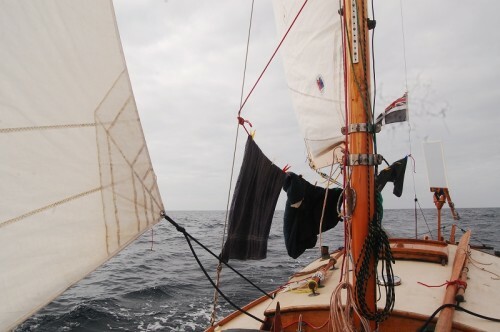 Around the Lizard and North, my Cornish ensign fluttering proudly. As I passed Black Rock, I decided to head straight up to Mylor, and surprise my friend Steve, who I knew was working on his old Danish fishing boat up and Cockwell’s yard (formerly Hurd’s). I moored at the Mylor marina in the afternoon – it had taken me 54 hours, which I thought was pretty good, considering my becalming. I wandered up to where the Annette was having some fresh planks nailed in, and was greeted with a cold beer and a putty knife. A bit of grafting and a hot meal later, and I was snoring like a bow-saw.